The Danube-Carpathian region – also known as the Green Heart of Europe - is home to some two-thirds of Europe’s populations of large carnivores, including brown bears, wolves and lynx. 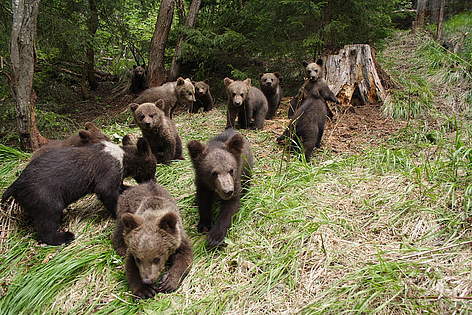 Bears and other large carnivores suffer from illegal hunting. But arguably a greater, longer-term threat lies in the fragmentation and degradation of their habitats e.g. from infrastructure construction. Conflicts between people and large carnivores are also growing, mostly due to inappropriate behavior by people. Corridors and conservation areas: We focus our efforts on securing critical corridors and conservation areas, e.g. in the southwest Carpathians (the Lugoj-Deva motorway construction) and in Maramures. Awareness and education: We also promote public awareness regarding bears, wolves and lynx – to increase appreciation and understanding of these magnificent animals and their vital role in managing ecosystems, and to help people avoid unnecessary conflicts with them.